A MEME IS NOW CIRCULATING THAT GOLD IS NOW IN A BUBBLE and that it’s time for the wise investor to sell. To me, that’s a ridiculous notion. Certainly a premature one. It pays to remain as objective as you can be when analyzing any investment. People have a tendency to fall in love with an asset class, usually because it’s treated them so well. We saw that happen, most recently, with Internet stocks in the late ‘90s and houses up to 2007. Investment bubbles are driven primarily by emotion, although there’s always some rationale for the emotion to latch on to. Perversely, when it comes to investing, reason is recruited mainly to provide cover for passion and preconception. In the same way, people tend to hate certain investments unreasonably, usually at the bottom of a bear market, after they’ve lost a lot of money and thinking about the asset means reliving the pain and loss. Love-and-hate cycles occur for all investment classes. But there’s only one investment I can think of that many people either love or hate reflexively, almost without regard to market performance: gold. And, to a lesser degree, silver. It’s strange that these two metals provoke such powerful psychological reactions – especially among people who dislike them. Nobody has an instinctive hatred of iron, copper, aluminum or cobalt. The reason, of course, is that the main use of gold has always been as money. And people have strong feelings about money. Let’s spend a moment looking at how gold’s fundamentals fit in with the psychology of the current market. Let me first disclose that I’ve always been favorably inclined toward gold, simply because I think money is a good thing. Not everyone feels that way, however. Some, with a Platonic view, think that money and commercial activity in general are degrading and beneath the “better” sort of people – although they’re a little hazy about how mankind rose above the level of living hand-to-mouth, grubbing for roots and berries. Some think it’s “the root of all evil,” a view that reflects a certain attitude toward the material world in general. Some (who have actually read St. Paul) think it’s just the love of money that’s the root of all evil. Some others see the utility of money but think it should be controlled somehow – as if only the proper authorities knew how to manage the dangerous substance. From an economic viewpoint, however, money is just a medium of exchange and a store of value. Efforts to turn it into a political football invariably are a sign of a hidden agenda or perhaps a psychological aberration. But, that said, money does have a moral as well as an economic significance. And it’s important to get that out in the open and have it understood. My view is that money is a high moral good. It represents all the good things you hope to have, do and provide in the future. In a manner of speaking, it’s distilled life. That’s why it’s important to have a sound money, one that isn’t subject to political manipulation. Of the 92 naturally occurring elements, gold (secondarily silver) has proved the best money. It’s not magic or superstition, any more than it is for iron to be best for building bridges and aluminum for building airplanes. Of course we do use paper as money today, but only because it recently served as a receipt for actual money. Paper money (currency) historically has a half-life that depends on a number of factors. But it rarely lasts longer than the government that issues it. Gold is the best money because it doesn’t need to be “faith-based” or rely on a government. There’s much more that can be said on this topic, and it’s important to grasp the essentials in order to understand the controversy about whether or not gold is in a bubble. But this isn’t the place for an extended explanation. Keep these things in mind, though, as you listen to the current blather from talking heads about where gold is going. Most of them are just journalists, reporters that are parroting what they heard someone else say. And the “someone else” is usually a political apologist who works for a government. Or a hack economist who works for a bank, the IMF or a similar institution with an interest in the status quo of the last few generations. You should treat almost everything you hear about finance or economics in the popular media as no more than entertainment. So let’s take some recent statements, assertions and opinions that have been promulgated in the media and analyze them. Many impress me as completely uninformed, even stupid. But since they’re floating around in the infosphere, I suppose they need to be addressed. This objection is worth considering – for any asset. In fact, it’s critical. We can determine the price of almost anything fairly easily today, but figuring out its value is as hard as it’s ever been. From the founding of the U.S. until 1933, the dollar was defined as 1/20th of an ounce of gold. From 1933 it was redefined as 1/35th of an ounce. After the 1971 dollar devaluation, the official price of the metal was raised to $42.22 – but that official number is meaningless, since nobody buys or sells the metal at that price. More importantly, people have gotten into the habit of giving the price of gold in dollars, rather than the value of the dollar in gold. But that’s another subject. It is hard to determine the value of anything when the inch marks on your yardstick keep drifting closer and closer together. The smart money is long gone from gold. Risk is largely a function of price. And, as a general rule, the higher the price the higher the risk, simply because the supply is likely to go up and the demand to go down – leading to a lower price. So, yes, gold is riskier now, at $1,400, than it was at $700 or at $200. But even when it was at $35, there was a well-known financial commentator named Eliot Janeway (I always thought he was a fool and a blowhard) who was crowing that if the U.S. government didn’t support it at $35, it would fall to $8. In any event, risk is relative. Stocks are very risky today. Bonds are ultra risky. Real estate is in an ongoing bear market. And the dollar is on its way to reaching its intrinsic value. Yes, gold is risky at $1,400. But it is actually less risky than most alternatives. This is kind of true. But only in the sense that a $100 bill pays no interest. You can get interest from anything that functions as money if it is lent out. Interest is the time premium of money. You will not get interest from either your $100 or from your gold unless you lend them to someone. But both the dollars and the gold will earn interest if you lend them out. The problem is that once you make a loan (even to a bank, in the form of a savings account), you may not even get your principal back, much less the interest. Gold costs you insurance and storage. This is arguably true. But it’s really a sophistic misdirection to which many people uncritically nod in agreement. You may very well want to insure and professionally store your gold. Just as you might your jewelry, your artwork and most valuable things you own. It’s even true of the share certificates for stocks you may own. It’s true of the assets in your mutual fund (where you pay for custody, plus a management fee). Gold has no real use. This assertion stems from a lack of knowledge of basic chemistry as well as economics. Yes, of course people have always liked gold for jewelry, and that’s a genuine use. It’s also good for dentistry and micro-circuitry. Owners of paper money, however, have found the stuff to be absolutely worthless hundreds of times in many score of countries. In point of fact, gold is useful because it is the most malleable, the most ductile and the most corrosion resistant of all metals. That means it’s finding new uses literally every day. It’s also the second most conductive of heat and electricity, and the second most reflective (after silver). Gold is a hi-tech metal for these reasons. It can do things no other substance can and is part of the reason your computer works so well. The U.S. can, or will, sell its gold to pay its debt, depressing the market. I find this assertion completely unrealistic. 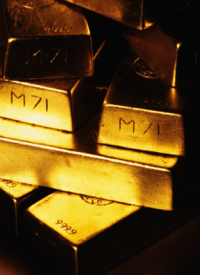 The U.S. government reports that it owns 265 million ounces of gold. Let’s say that’s worth about $400 billion right now. I’m afraid that’s chicken feed in today’s world. It’s only a quarter of this year’s federal deficit alone. It’s only half of one year’s trade deficit. It represents only about 5% of the dollars outside the U.S. The U.S. government may be the largest holder of gold in the world, but it owns less than 5% of the approximately 6 billion ounces above ground. From the ‘60s until about 2000, most Western governments were selling gold from their treasuries, working on the belief it was a “barbarous relic.” Since then, governments in the advancing world – China, India, Russia and many other ex-socialist states – have been buying massive quantities. High gold prices will bring on huge new production, which will depress its price. This assertion shows a complete misunderstanding of the nature of the gold market. Gold production is now about 82.6 million ounces per year and has been trending slightly down for the last decade. That’s partly because at high prices miners tend to mine lower-grade ore. And partly because the world has been extensively explored, and most large, high-grade, easily exploited resources have already been put into production. That’s not to say things can’t change. The asteroids have lots of heavy metals, including gold; space exploration will make them available. Gigantic amounts of gold are dissolved in seawater and will perhaps someday be economically recoverable with biotech. It’s now possible to transmute metals, fulfilling the alchemists dream; perhaps someday this will be economic for gold. And nanotech may soon allow ultra-low-grade deposits of gold (and every other element) to be recovered profitably. But these things need not concern us as practical matters in the course of this bull market. You should have only a small amount of gold, for insurance. This is poor speculative theory. The intelligent investor allocates his funds where it’s likely they’ll provide the best return, consistent with the risk, liquidity and volatility profile he wants to maintain. There are times when you should be greatly overweight in a single asset class – sometimes stocks, sometimes bonds, sometimes real estate, sometimes what-have-you. For the last 12 years, it’s been wise to be overweight in gold. You always want some gold, simply because it’s cash in the most basic form. But ten years from now, I suspect that will be a minimum. Right now it’s a maximum. The idea of keeping a constant, but insignificant, percentage in gold impresses me as poorly thought out. Interest rates are at zero; gold will fall as they rise. In principle, as interest rates rise, people tend to prefer holding currency deposits. So they tend to sell other assets, including gold, to own interest-earning cash. But there are other factors at work. What if the nominal interest rate is 20%, but the rate of currency depreciation is 40%? Then the real interest rate is minus 20%. This is more or less what happened in the late ‘70s, when both nominal rates and gold went up together. Right now governments all over the world are suppressing rates even while they’re greatly increasing the amount of money outstanding; this will eventually (read: soon) result in both much higher rates and a much higher general price level. At some point high real rates will be a factor in ending the gold bull market, but that time is many months or years in the future. Gold sentiment is at an all-time high. Although gold prices are at an all-time high in nominal terms, they are still nowhere near their highs in real terms, of about $2,500 (depending on how much credibility you give the government’s CPI numbers), reached in 1980. Gold sentiment is still quite subdued among the public; most of them barely know it even exists. Some journalists like to point out that since there are a few (five, perhaps) gold dispensing machines in the world, including one in the U.S., that there’s a gold mania afoot. That’s ridiculous, although it shows a slowly awakening interest among people with assets. Journalists also point to the numerous ads on late-night TV offering to buy old gold jewelry (generally at around a 50% discount from its metal value) as a sign of a gold bubble. But this is even more ridiculous, since the ads are inducing the unsophisticated, cash-strapped booboisie to sell the metal, not buy it. You’ll know sentiment is at a high when major brokerage firms are hyping newly minted gold products, and Slime Magazine (if it still exists) has a cover showing a golden bull tearing apart the New York Stock Exchange. We’re a long way from that point. This is absolutely true. In general, mining is a horrible business. It requires gigantic fixed capital expense to build the mine, but only after numerous, expensive and unpredictable permitting issues are handled. Then the operation is immovable and subject to every political risk imaginable, not infrequently including nationalization. Add in continual and formidable technical issues of every description, compounded by unpredictable fluctuations in the price of the end product. Mining is a horrible business, and you’ll never find Graham-Dodd investors buying mining stocks. All these problems (and many more that aren’t germane to this brief article), however, make them excellent speculative vehicles from time to time. Mineral exploration stocks are very, very risky. Warren Buffett is a huge gold bear. I’ve long considered Buffett an idiot savant – a genius at buying stocks but at nothing else. His statement is quite accurate, but completely meaningless. The same could be said of the U.S. dollar money supply – or even of the world inventory of steel and copper. These things represent potential but are not businesses or productive assets in themselves. Buffett is certainly not stupid, but he’s a shameless and intellectually dishonest sophist. And although a great investor, he’s neither an economist or someone who believes in free markets. Gold is a religious statement. Actually, since most religions have an otherworldly orientation, they’re at least subtly (and often stridently) anti-gold. But it is true that some promoters of gold seem to have an Elmer Gantry-like style. That, however, can be said of True Believers in anything, whether or not the belief itself has merit. In point of fact, I think it’s more true to say goldphobes suffer from a kind of religious hysteria, fervently believing in collectivism in general and the state in particular, with no regard to counter-arguments. Someone who understands why gold is money and why it is currently a good speculative vehicle is hardly making a religious statement. More likely he’s taking a scientific approach to economics and thinking for himself. So these are some of the more egregious arguments against gold that are being brought forward today. Most of them are propounded by knaves, fools or the uninformed. The question is: At what price will that occur, relative to other things? It’s not just a question of picking a dollar price, because the relative value of many things – houses, food, commodities, labor – have been distorted by a very long period of currency inflation, increased taxation and very burdensome regulation that started at the beginning of the last depression. Especially with the fantastic leaps in technology now being made and breathtaking advances that will soon occur, it’s hard to be sure exactly how values will realign after the Greater Depression ends. And we can’t know the exact manner in which it will end. Especially when you factor in the rise of China and India. A guess? I’ll say the equivalent of about $5,000 an ounce of today’s dollars. And I feel pretty good about that number, considering where we are in the current gold bull market. Classic bull markets have three stages. We’ve long since left the “Stealth” stage – when few people even remembered gold existed, and those who did mocked the idea of owning it. We’re about to leave the “Wall of Worry” stage, when people notice it and the bulls and bears battle back and forth. I’ll conjecture that within the next year we’ll enter the “Mania” stage – when everybody, including governments, is buying gold, out of greed and fear. But also out of prudence. The policies of Bernanke and Obama – but also of almost every other central bank and government in the world – are not just wrong. These people are, perversely, doing just the opposite of what should be done to cure the problems that have built up over decades. One consequence of their actions will be to ignite numerous other bubbles in various markets and countries. 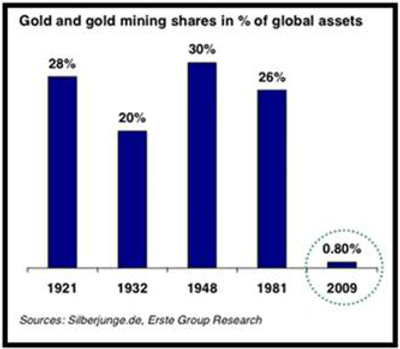 I expect the biggest bubble will be in gold, and the wildest one in mining and exploration stocks. When will I sell out of gold and gold stocks? Of course, they don’t ring a bell at either the top or the bottom of the market. But I expect to be a seller when there really is a bubble, a mania, in all things gold-related. There’s a good chance that will coincide to some degree with a real bottom in conventional stocks. I don’t know what level that might be on the DJIA, but I’d think its average dividend yield might then be in the 6 to 8% area. The bottom line is that gold and its friends are no longer cheap, but they have a long way – in both time and price – to run. Until they’re done, I suggest you be right and sit tight.